The trees and woodlands of the Island shelter a remarkable number of species, especially mammals, which have captured our imaginations - red squirrels, bluebells, dormice, bats and great oaks. The Isle of Wight is not regarded as a particularly well-wooded county by regional standards and yet the total area of woodland cover is around the national average, occupying around 11% of the Island�s land surface with the total extent is relatively stable, with any losses offset by gains through new planting and natural regeneration. Around 40% are on �ancient� (pre 1600) woodland sites. These are often the richest in biodiversity. The total area of woodland occupying known ancient sites is 1,614 hectares covering just over 4% of the Island�s land surface. Although some 900ha of these retain their original character, a further 714ha have been replanted with conifers or non-native broadleaves since the beginning of the twentieth century. Many are gradually being restored by removing non-native species. Islanders have an awareness of woodland issues which is often greater than that on the mainland because of closer community ties and particularly the very highly regarded red squirrel. Most of the large wooded areas managed by the Forestry Commission are accessible to the visitor. Parkhurst Forest, north of Newport, was mentioned in the Domesday records as a royal hunting forest which, at that time, extended as far north as Cowes (hence the village name of Northwood). Though the forest has changed much since then, it still has some of the best oak trees on the Island, as well as a number of Scots and Corsican pine. Follow the well way-marked Pine and Oak Forest Trails to see the Island's most famous inhabitant, the red squirrel. Flowers thrive in the glades where light can penetrate through the trees above. This is a particular feature of Firestone Copse, situated near Wootton, where a large area of hazel has been coppiced (cut and left to regrow naturally). In the west, Brighstone Forest is a mix of plantation beech and conifer set on top of the downs. The great storm of 1987 felled large areas of the conifer plantation which have been left open in an attempt to restore some of the remnant heathland, home to nightjars in the summer. Borthwood Copse, near Sandown is owned by the National Trust and is a fragment of the medieval forest which covered most of the eastern end of the Island. Here, there are some fine oak and beech trees which stand amongst glades of coppiced sweet chestnut and hazel. A bridleway and a myriad of smaller paths guide you through this beautiful woodland, a joy to behold in the autumn with its vivid colours and, in the spring time, when carpeted with bluebells. America Wood behind Shanklin is another ancient woodland open to the public and of similar quality. - Provide descriptions of the woodlands to show what they are like now. - Show the process of deciding the vision for the long term future. - Show how the woodlands will look in twenty years time. - Show management proposals, in some detail for the first ten years, and in outline for the succeeding twenty years. The Isle of Wight Forest Design Plan, which went out to public consultation in 2004 and 2005, is designed to ensure the state forests are managed in a sustainable manner providing social, economic and environmental benefits to the local community and visitors from further afield. The ancient semi-natural woodland is predominately ash-maple woodland (NVC W8) on calcareous and clay soils, and oak woodland (NVC W10) on more acid and sometimes sandy soils. Most woods show clear evidence of management as coppice woodland and hazel is a common understorey shrub. The richest woods biologically are those situated on the clay soils of the northern half of the Island and this is where the majority of our ancient woodland survives. Those fringing the Solent coasts and estuaries are nationally important showing some of the best transitions from woodland through brackish marsh and soft cliff to saltmarshes and intertidal mud. Another aspect of ancient woodland on the Island is the presence of neglected wood pasture. Here standard trees of great age, with their associated species, survive in the absence of the grazing pressure to which they were once subject. Woodland such as Northpark Copse, the northern part of Parkhurst Forest, and perhaps America Wood and Borthwood Copse contain the last vestiges of these habitats, though they are masked by developing young trees, understorey and scrub. Many, but not all, of the species associated with wood pasture have been lost as a result of the cessation of grazing. The wet river valley woods at Gatcombe include an area of alder woodland which has intrinsic importance as peat cores indicate that this area has supported alder carr continuously since circa 7000 BP. As such it is a rare example of alder woodland persisting on the same site since the end of the last glaciation. Secondary woods tend to be dominated by ash, elm or sycamore and in wetter areas with sallow carr. They generally have lower nature conservation value, but some secondary woods can become species-rich relatively quickly through natural regeneration. Some secondary woodland within the shelter of the Undercliff coastline along the south coast can support Bryophyte communities with western Atlantic affinities. Other small, exposed, scrubby woodlands along the south-west coast are of long-standing. They can support luxuriant lichen communities and can provide valuable shelter for migrant and resident birds. Large herbivores are absent from the Island and this leads to good coppice growth and natural regeneration in turn promoting arboreal species such as red squirrel and dormice, particularly on the heavy clay soils to the north of the Island. The Island is now the only county in Britain where both of these mammal species exist together in their natural habitat and is also possibly the best locality in Britain for the Bechstein’s bat. These mammals are not confined to ancient woodland, but are able to disperse freely through woodlands of various types. There is an increasing recognition that many woodland species are nationally declining. At this stage, the reasons for this are unclear, but the considerable damaging impact of deer and grey squirrels in mainland woodlands is considered to be a contributing factor - both are absent from the Island. England's first inventory of ancient woodland was initiated in 1981 by the Nature Conservancy Council. Over the last 10 years the ancient woodland inventory has been revised for most of South East England, and for the first time includes woods smaller than 2 hectares, and a more comprehensive methodology. The first Ancient Woodland Inventory for the Isle of Wight was produced in 1987. 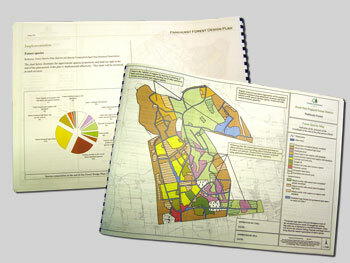 This involved a detailed desk based study of historic maps and was informed by historical records and surveys. Records of ancient woodland indicator species were also considered. In line with national guidance at the time mostly woodland of two or more hectares in size was captured in this process. This survey resulted in 1594.39 hectares of ancient woodland being recorded. In 2012 the Isle of Wight Biodiversity Partnership commissioned a revised Ancient Woodland inventory for the Island, and this was completed in 2014. The whole of the Isle of Wight ancient woodland resource has been re-examined as part of this review. The results of the review show a total ancient woodland area of 1602.43 hectares - an increase of 8.04 hectares or 0.5% which is equivalent to 4.06% of the Isle of Wight area. This overall figure, although showing a small increase in ancient woodland cover, belies the changes to the extent of individual ancient woodland sites and the capture of many smaller ancient woodlands that are a direct result of this review. Citation: Brownscombe, J. (2014). A revision of the Isle of Wight Ancient Woodland Inventory. 1st ed. Isle of Wight: Isle of Wight Biodiversity Partnership.